"Why did you run, Mr. Kelly?" Samuel Goldwyn has unveiled an official US trailer for an Australian racism drama titled Sweet Country, from acclaimed director Warwick Thornton (of Samson & Delilah). This first premiered at the Venice Film Festival last year, and played at the Toronto and London Film Festivals. It also plays at the Sundance Film Festival this month hitting pretty much every big fest. 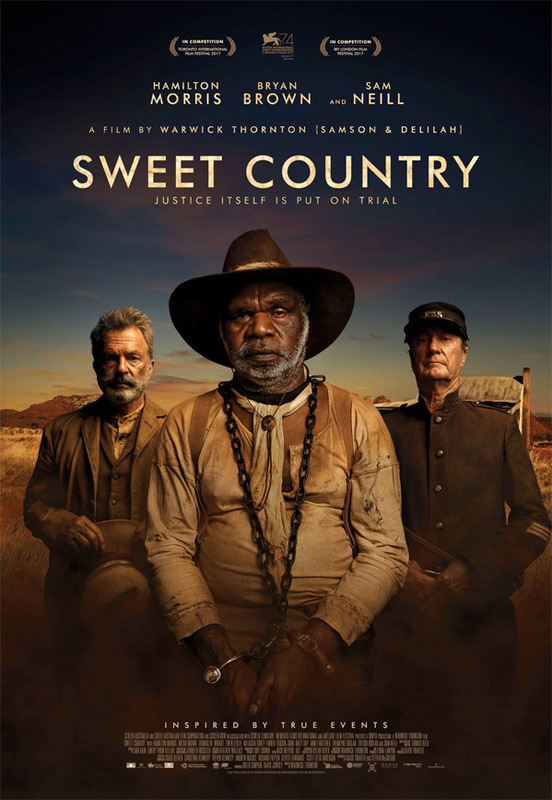 Sweet Country takes place in the Northern Territory of Australia nearly 100 years ago, telling the story of an Aboriginal stockman who shoots a white man and is taken to trial. Hamilton Morris stars, with Sam Neill, Ewen Leslie, Bryan Brown, Thomas M. Wright, and Matt Day. I saw this already in Venice and I liked it, but it's not my cup of tea - way too dry and slow for me. But other critics seem to be loving it, so it may still be worth your time. You can still see the first international trailer for Sweet Country here, to see more footage from this. Accused of murder, an Aboriginal stockman and his wife try to stay ahead of a fervent posse in the harsh outback of the Northern Territory, in this period drama from acclaimed Australian filmmaker Warwick Thornton. Sweet Country is directed by Australian cinematographer/filmmaker Warwick Thornton, of the films Samson & Delilah, The Darkside, and We Don't Need a Map previously, as well as many short films. The screenplay is written by David Tranter and Steven McGregor. This first premiered at the Venice, Toronto, and London Film Festivals last year. It is also playing at the 2018 Sundance Film Festival this month. The film opens in Australia in February. Samuel Goldwyn Films will then release Thornton's Sweet Country in select US theaters sometime in early spring of 2018. No date is set yet. Stay tuned. Interested?